(Bloomberg) -- Trillions of dollars of investment are needed to combat global warming. Enter green bonds, a way for issuers to raise money specifically for environmentally friendly projects -- such as renewable energy or clean transport -- and to be able to boast about it publicly. Fund managers also like the notes as a way of meeting growing investor demand for sustainable options. The market, which opened slowly more than a decade ago, has boomed in recent years, helping spur development of other socially conscious debt products. Because investors face the challenge of judging whether a note is truly green, regulators are working on standards to help guard against greenwashing, or misleading claims about just how good a friend to the environment an issuer is. 1. What do green bonds finance? 2. How big is the global green-bond market? A cumulative $580 billion of green bonds were sold through 2018, according to Bloomberg New Energy Finance. Another $170 billion to $180 billion are likely to be sold in 2019 based on what’s currently happening in the market, BNEF analyst Daniel Shurey says. The market is expected to keep growing, with Europe alone needing about 180 billion euros ($203 billion) of additional investment a year to achieve 2030 emission targets set by the European Union in the 2015 Paris Agreement on climate change. For now, however, green bonds are a tiny fraction of the more than $100 trillion global bond market. 3. Who sells green bonds? Issuers from more than 50 countries have sold green bonds including supranational institutions such as the World Bank and the EU’s European Investment Bank. Companies are also in the market, along with local, state and national governments. The first emerging-market green bond was issued in South Africa in 2012. Poland opened the sovereign market in 2016, followed by the likes of France, Belgium and Ireland. The U.S. is the largest source overall, led by the mortgage giant Fannie Mae and local governments selling notes to finance infrastructure such as sewerage upgrades. 4. Who decides whether a bond is green? 5. Just how green are green bonds? New coal projects get labeled brown for being in opposition to what Cicero calls a “climate-resilient future.” There’s also debate over whether an issuer’s overall environmental commitment or carbon footprint should be taken into account. 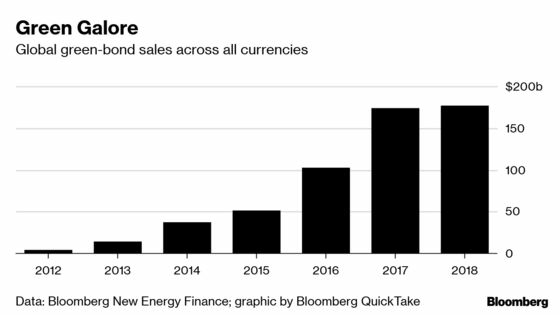 Poland’s sovereign green bonds were snubbed by at least one major investor because of the country’s reliance on coal and its mixed record on climate action. In 2017, Madrid-based Repsol SA became the first major oil company to sell green bonds. 6. Is there hope for a global green bond standard? Yes. The EU is creating a Green Bond Standard, which will build on current market practices, such as the ICMA Green Bond Principles. Issuers from anywhere in the world will be able to cite compliance, if their plans are independently verified by an EU-accredited assessor. However, the new standard will be voluntary, rather than legally binding. The European Commission, the EU’s executive arm, has directed a group of experts to make recommendations. The International Organization for Standardization is also preparing a Green Bond Standard that will draw upon existing principles. 7. Who buys green bonds? In general, it’s the same as the rest of the bond market -- institutional investors including pension funds, insurance companies and asset managers. The overall green market is also getting a boost from investors seeking “responsible” or “sustainable” places to put their money. That has helped Europe’s listed green funds double assets under management since 2013 to more than 32 billion euros in 2017, according to Novethic, a sustainable finance data provider. In 2015, France became the first country to require institutional investors to report how they consider environmental factors. The EU is likely to encourage asset managers across the bloc to integrate sustainability requirements into investment decisions as part of its work on the Green Bond Standard. 8. Does green investing mean compromising on returns? Not necessarily. The vast majority of green bonds are investment grade and they are priced similarly to conventional debt at issuance. Growing investor demand and relative scarcity could also help boost secondary market prices. In the euro market, green bonds returned 0.34 percent in 2018, while the overall investment-grade market returned 0.41 percent, based on Bloomberg Barclays indexes. But for issuers themselves, bringing a green bond to the market can entail additional costs to cover getting an external opinion and report annually on the use of proceeds. 9. Are green bonds the same as sustainable bonds? No. Green bonds are used solely for environmental goals, while sustainable bonds combine both environmental and social objectives. There are also social bonds, whose proceeds are dedicated to projects aimed at improving social welfare or helping disadvantaged populations. The range of socially conscious instruments keeps growing as more investors look to do good while making money, and regulators look to the instruments to influence policy and investment decisions. There are now loans linked to specific environmental, social or governance targets, which give companies an incentive to achieve what they say they will. And in October, the Seychelles sold the world’s first sovereign blue bond, debt issued to finance marine and ocean-based projects that have positive environmental, economic and climate benefits. A QuickTake on sustainable investing. How to use Bloomberg’s green loan principles table. Bloomberg NEF analysis of external reviews for green bond. For Bloomberg NEF’s sustainable debt tool. Expectations for China’s green debt market. A royal visit led the Seychelles to invent a new bond.